Barbra Streisand appeared as a guest on The Ed Sullivan Show five times in the 1960s. The Ed Sullivan Show was the quintessential variety show. As the host, Sullivan presented an entertaining array of performers each week: rock stars like The Beatles or The Rolling Stones; excerpts from Broadway's greatest shows like Camelot or Oliver; variety acts that spun bottles or balanced rings; and cultural artists like the Bolshoi Ballet or Joan Sutherland. Each of Streisand's appearances on The Ed Sullivan Show are chronicled below. Liberace was a guest on this same show and it's said he asked Streisand to appear with him at The Riviera Hotel after seeing her on Sullivan. Also of note ... The Clancy Brothers and Tommy Makem—an Irish folk-singing group—also appeared on this episode, which must have made Marty Erlichman proud: he was managing both Streisand and the Clancy Brothers at the time. Below: At what was probably the dress rehearsal for that evening's Sullivan show, Barbra wore a similar, but different dress — the one pictured below has an ostrich feathered hem; Barbra is wearing her hair differently, as well. Streisand sang “Cry Me A River” on this show, looking out of a window. Other guests that night were Chubby Checker, Woody Herman, Totie Fields, Dave Madden, Morecambe and Wise, and Tommy Cooper. Barbra Streisand sang “When the Sun Comes Out” on this episode. Appearing on that evening's show were the McGuire Sisters and Sue Carson. The comedy team Stiller & Meara also appeared on the June 9th episode. Jerry Stiller and Anne Meara often performed in some of the same, small New York clubs that Streisand got her start in. Also, they are the parents of Ben Stiller, whom Barbra starred with in the films Meet the Fockers and Little Fockers. You can purchase the DVD, The Very Best of the Ed Sullivan Show: Unforgettable Performances Volume 1, which features an excerpt of Streisand singing “When the Sun Comes Out” at Amazon.com. Hosted by Carol Burnett, the DVD features over 90 minutes of incredible talent, featuring: Louis Armstrong, Lucille Ball, The Beatles, James Brown, The Doors, Ella Fitzgerald, Jackson 5, Elvis Presley, The Rolling Stones, The Supremes, Topo Gigio and many more! Streisand did not perform on this episode. However, most weeks Sullivan would introduce a celebrity who was sitting in the audience and have them take a bow. 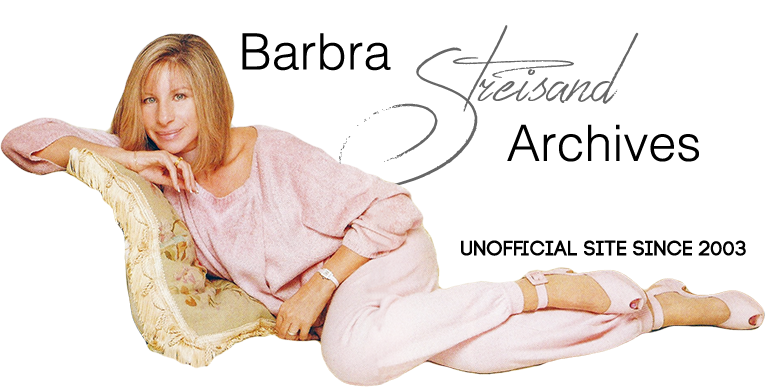 This week, Sullivan introduced Streisand, who was sitting next to her husband, Elliott Gould. Streisand took her bow right after the animal act, the Bauman Tigers, performed. Performing this week were The Kessler Twins, comedian Jack Carter, and Harry Belafonte.